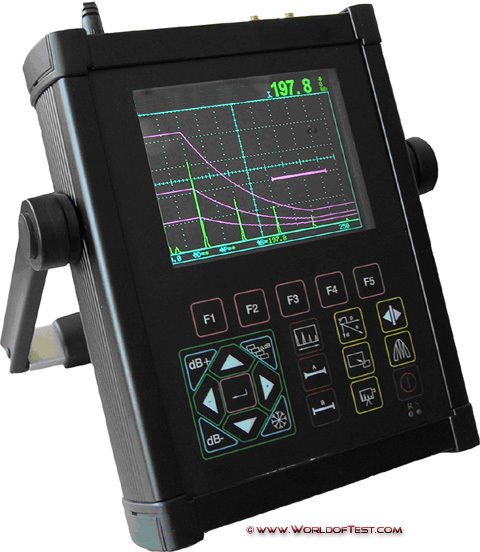 Start point(mm): horizontal pixel 0~208, with display value relating to scanning range. 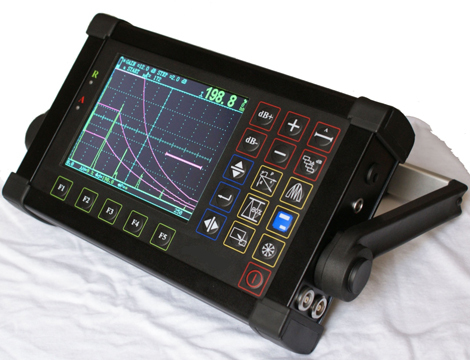 Width(mm): horizontal pixel 4~212, with display value relating to scanning range. 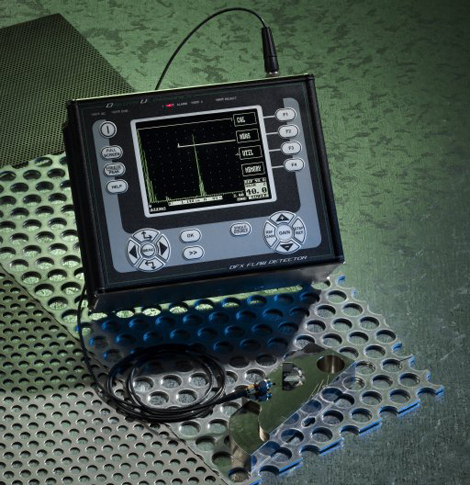 The Advanced Flaw Detectors - DFX series ultrasonic flaw detectors are full featured digital scopes designed to handle the simplest to the most difficult applications. Whether the application requires high penetration for materials that are difficult to measure, or high resolution for precision aerospace parts, the Advanced Flaw Detectors - DFX series flaw detectors are equipped with the necessary features to do the job. Advanced Flaw Detectors - DFX series can go where you go, to do the work you do, saving you time and money, making your inspections fast and accurate. Battery: Lithium Ion battery pack 14.4V, 5.0 Amp hrs. Minimum 11 hours use, typical 15 hours, indication of battery charge. Recharge time 4 hours. Charger: 100 - 240 VAC, 50 - 60Hz. USB: For connection to PC, keyboard and printer. Outputs: Serial Interface, composite video (NTSC & PAL), analog output for amplitude and distance updated at PRF rate. Transmitter sync output. Transducer Connectors: available with BNC or LEMO 1 connectors (factory option). Interface trigger: Interface gate locks to surface echo and eliminates water path variation. High Power Pulser: 450 volt boost. 7.5lbs. (3,4Kgs) with Li-Ion cells. Display: Transflective TFT Color. Display area: 4.39” x 3.29” (111.4 x 83.5mm) 320 x 240 pixels. A-Scan area: 255 x 200 pixels (315 x 200 expanded), 8 color options and variable brightness. Metric (mm), or Time (µs). Velocity: 615 & 625 0.0393 to 0.3937 in/µs (1000–9999m/s). 635 & 638 0.0100 in/µs (256 to 16000 m/s. Test Range: 615 & 625 0 - 0.2in (5mm) up to 0 - 400in (10,000mm) at steel velocity. Variable in sequence, 0.4in or 0.04in (10mm or 1mm). 635 & 638 0 - 0.05in (1mm) up to 0 - 800in (20,000mm) at steel velocity. Variable in 1, 2, 5 sequence or continuously in 0.05in (1mm) increments. Also from 1 to 5000(µs). Test Modes: Pulse-echo and transmit/receive. Gates: 615 & 625 Start & Width adjustable over full range. Amplitude 0 -100%, 0.5% steps. Visual & audible alarms. Single gate positive trigger, and two gates positive and negative triggering. Gate 2 has selectable 0.6 second delay on alarm. 635 & 638 Two fully independent gates with positive and negative triggering for each gate. 635 & 638 Expands range to width of Gate 1. 635 & 638 Selectable 0.6 sec delay on gate 2 negative monitor. Signal Monitor - 635 & 638. Depth - Depth and amplitude of signal in gate. Echo-Echo distance, automatic gate 2 position. 625 Echo-Echo , manual gate 2 position. 635 & 638 independent gates. Trig - Trigonometric display of beam path, depth and surface distance. Calculation of skip depth and curve surface compensation, X-offset for transducer. T-Min - Holds minimum thickness in depth mode. System Linearity: Vertical = 1% Full Screen Height (FSH) Amplifier Accuracy ±0.1%dB. Horizontal ±0.4% Full Screen Width (FSW). Pulser Voltage: 615 & 625 200 volt peak amplitude, rise/fall time < 10ns into 50ohm. 635 & 638 100V - 350V (450V 638 ) square wave pulser. Pulse width from spike to 2000ns duration - rise/fall times < 5ns into 50 ohms. Pulser Width: 615 fixed at 100ns. 625 30-250ns linked to filter band. 635 & 638 Adjustable in 2% of nominal width, minimum 1ns maximum 40ns. Active Edge: Unique active pulse control for enhanced near surface resolution and signal response. Replaces traditional damping control. P.R.F. : 615 & 625 Selectable 35 to 1000Hz (635 & 638 5000Hz), 5Hz steps. Rectification: Full wave, positive or negative half wave and unrectified RF. 635 & 638 0 - 800in (20,000mm) at steel velocity in 0.02 steps (0.05mm). Adjustable in 0.5, 2, 6, 14 and 20dB steps. Frequency Bands: 615 4Broadband 1 - 10 MHz (-6dB). 625 4 Narrow Bands centered at 1MHz, 2MHz, 5MHz, & broadband 1.5–15MHz. 635 & 638 6 narrow bands centered at 0.5, 1, 2.25, 5, 10 & 15 MHz. Broad band at 2 to 22 MHz (-6dB) and 1 to 35 MHz (-20dB). +/- 0.4% full screen width (FSW). Reject: 615 & 625 50% suppressive reject. LED warning when selected. 635 & 638 80% linear reject. Thickness Logging: Storage for 8000 readings stored in Block/Location/Number coding or alpha-numeric pre-programmed work sheets. Transferable to Excel using optional PC software. 100 storage locations for calibration settings.